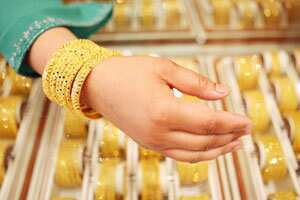 Mumbai: Gold demand in India rose on Friday, after prices fell 3% in the past two days, luring jewellers who began restocking and preparing for the wedding season beginning mid-January, dealers said. “For the past few weeks they were on sidelines expecting a price fall. Now, they think it is a good buying opportunity at current levels." At 3:42 pm, the most-active February gold on the Multi Commodity Exchange was 1.2% up at Rs27,157 per 10 grams, tracking a firm world market and on a weak rupee. Demand was weak earlier this week due to year-end holidays and ongoing Khar Mass. Khar Mass is a month in the Hindu calendar, from 16 December to 14 January, which is considered inauspicious for gold buying and starting new ventures. International spot gold rose 1% to $1,561.89 an ounce. The rupee, which plays an important role in determining the landed cost of dollar-quoted gold, fell to 53.3 to the dollar from Thursday’s close of 53.07/08, as importers stepped up dollar-buying.